Today, this is being written because I actually use it every single day. Like, every single day! I bring it to and from work with me. It stays on my desk all day long and I even bring it to dinner outings just in case something gets scheduled. It has now become a staple in my life and I understand how the reviews are so high. There were a ton of options to choose from for your cover. I went back and forth on three different ones until I finally chose mine. It all came down to the font and the color! The font wasn't customizable and I dreaded my last name on in so I went with my middle name. It looked much more polished. The color is something that I think makes it more unique because not everyone else chose my color. It reminds me of Spring and it'll keep me happy through out the winter. I love how the pink florals pop with the background. 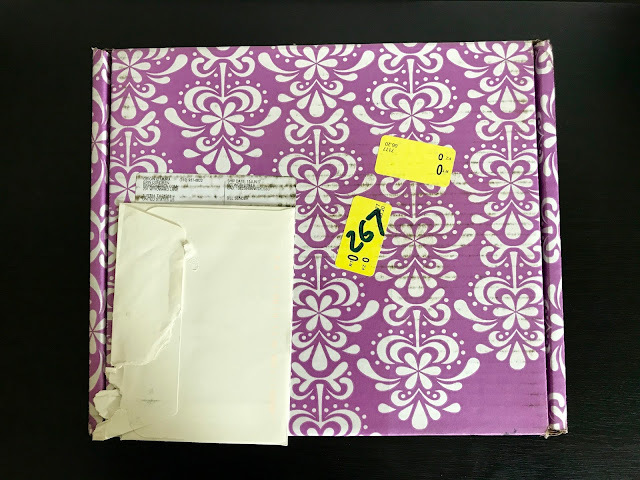 Everything is cute, including the box it was shipped in. I've seen other colors from other years. I'm keeping my box to reuse when something needs to be sent out in the future. They also came with positive thoughts on notecards and bookmarks. They have "to" and "from" sheets for gifts when you're in a pinch. So darling! I was SO excited when opening this box that I literally stopped to jump up and down in my apartment. 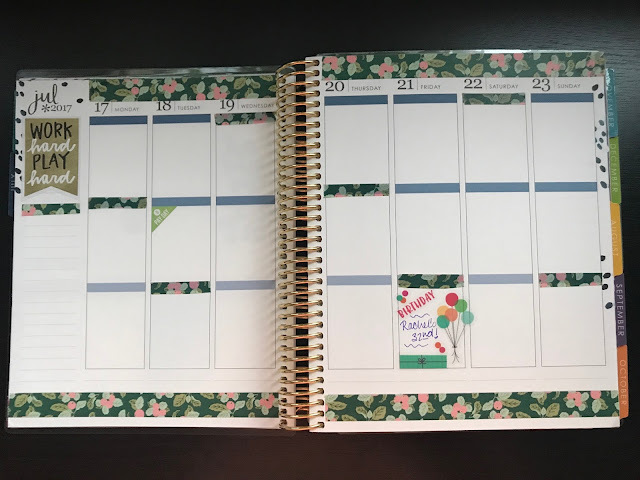 The reason I ended up purchasing this exact planner is because I could also customize stickers and it worked well with all of the events I would be helping to plan throughout the year. 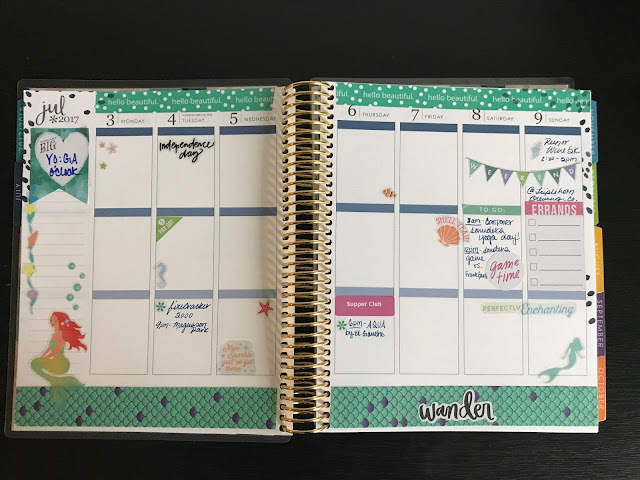 As part of the Junior League of Seattle, the committee I am on organizes a lot of social events and I wanted to make sure this planner would benefit my personal, work, social and non-profit lifestyle. The bonus of getting these stickers was keeping myself in line with color coordination and having them be by month. Another added bonus was the pouch and white board it came with. Two white boards, in the back and front. This is helpful for impromptu grocery lists and memos. The pouch holds my pens and extra stickers. Including my favorite little coffee ones. I purposely got the edition that has my days laid out by "Morning, Noon & Night". 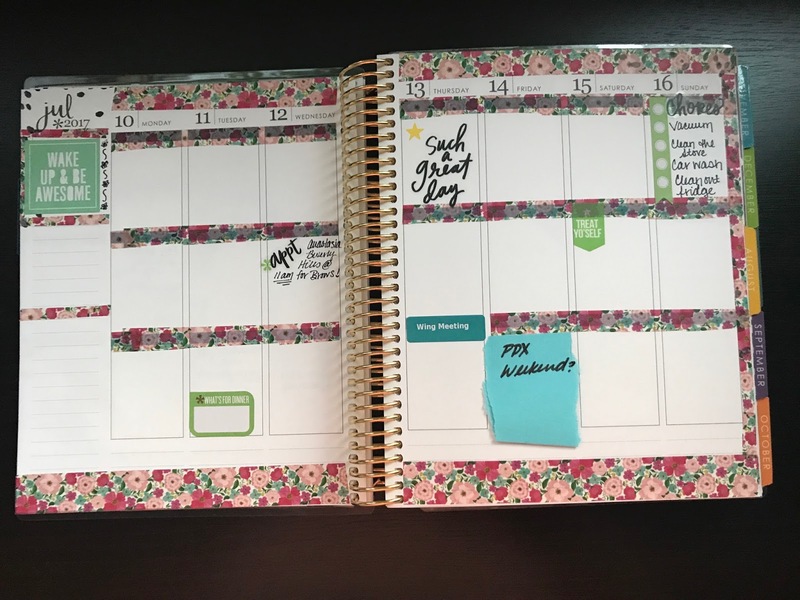 There was an option to have a section for each day or for it to go across but I plan my days and my meals by how I got the planner. It was the best version I could have gotten for myself. What I also appreciate is that every month comes equipped with a full month calendar along with the week/day long sheets. Below, you can also see there is a section for goal settings or perhaps a chores guide (which I've done before) that can be really helpful. Example of this is, this month (September) I'm doing a "no spend month" again. It's been super helpful keeping myself on a plan for the whole month. It also has inspirational quotes every month too. So far, my favorite part of planning has been decorating. I'll take some photos of my more recent entries. September is filling up very quickly and they're decorated with fitness stickers to keep me motivated to go to the gym. Honestly, this has been my best organizational purchase all year and I full plan to buy another one next year. 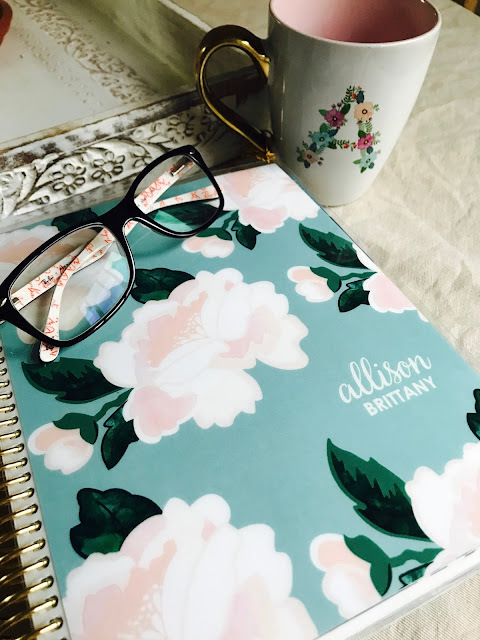 How do you keep organized throughout the year? What are your favorite planner products and have you used the Erin Condren planners before?